Departments are completely different to Demographics. So let’s leave Demographics to the side, and talk about Departments. As you would have learn’t in our Learn the Features section, departments are the way you organize your volunteers in Tithe.ly ChMS. They form the main ministry divisions (Children’s Ministry, Worship Ministry, etc.) in your church, and relate directly to rostering for your services. Departments are made of sub-departments and positions. 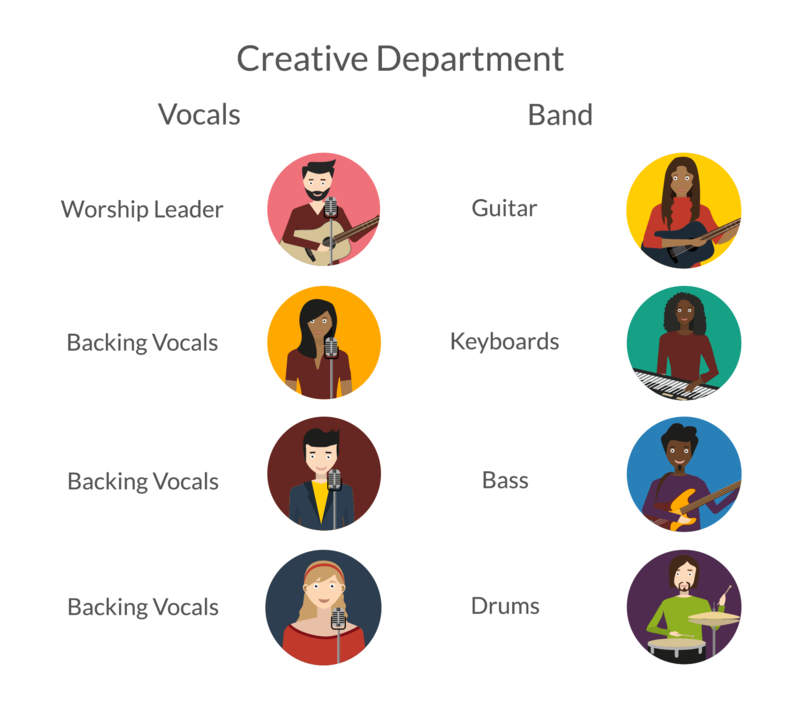 For example, your Creative department might include a ‘Band’ sub-department which listed all the different instrument positions used for rostering. The Band sub-department may include Guitar, Keyboards, Bass, and Drum. Each of these would be your positions, because you roster people on to do these. You can’t roster people on to sub-departments, only positions. Sub-departments are just a way of making it easier to organize contact people who do related roles. Because departments are all about rostering, you should set up a person to receive emails whenever someone declines a rostered position. Do this by appointing them as a ‘Reports To’ person for that sub-department, or position. Special departments are just like other departments, except you use them way less frequently. A Christmas service, for example, might not use your normal creative ministries department. This service might have a sub-department for people to man the nativity, have extra positions in the vocals sub-department, and extra positions for backstage people who throw snow everywhere. If this is how Christmas runs at your church most years, then add a ‘Christmas Creative Ministries’ department, which can be hidden in all other service types for the rest of the year. Want to know more about Departments? Check out this page in our Worship Ministry Guide which gives a good ministry specific example of how a department can be set up.